What Are the Benefits of Vitamin C Powder? Vitamin C, or ascorbic acid, is an essential, water-soluble vitamin that your body must obtain from outside sources like food or supplements. It occurs naturally in a wide variety of produce and is commonly included in multivitamin formulas, but it is also available in powdered form. 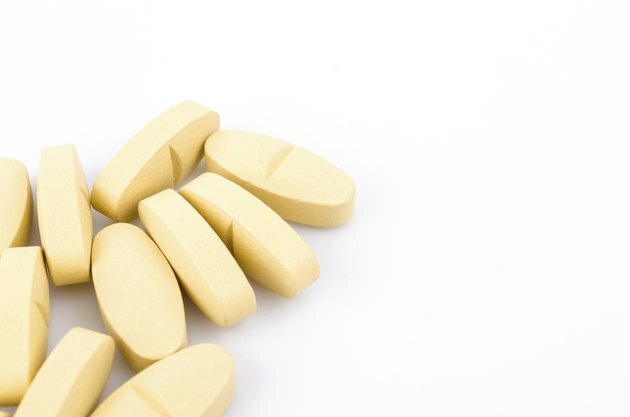 According to "The Best Supplements for Your Health" by Donald Goldberg, Arnold Gitomer and Robert Abel, powdered vitamin C bears some qualities that other forms don't, in addition to all the health benefits of ascorbic acid. According to Goldberg, Gitomer and Abel, there are two types of vitamin C powder: bicarbonate and fully reacted. Vitamin C bicarbonate powder, when mixed with water, becomes a fizzy, effervescent drink. Those who find this delightful and refreshing may opt to get their daily recommended dose of vitamin C from this product. Fully reacted vitamin C powder, also known as calcium ascorbate, is characterized by its lower acidity level when compared to vitamin C bicarbonate powder and many dietary sources of vitamin C, according to Goldberg, Gitomer and Abel. This product does not fizz when mixed with water, but it can be much easier to consume for people who are very sensitive to citric acid. All vitamin C supplements help support the healthy growth and repair of tissues, according to the National Institutes of Health. Vitamin C helps produce collagen, which is necessary for the formation of scar tissue, connective tissues and blood vessels. It contributes to the healing of internal and external wounds, and strengthens bones, teeth and cartilage. The National Institutes of Health also reports that vitamin C is an antioxidant, which means that it seeks out and binds with free radicals in the body. Free radicals are particles that are produced whenever your body breaks down nutrients to convert them into energy, and sometimes when your body is exposed to harmful substances like smoke or toxins. These particles scavenge for healthy cells and attack them, leading to premature cell death and advancing the aging process. In high amounts, free radicals can bring about premature aging. Antioxidants like vitamin C neutralize the harmful effects of these free radicals, saving at-risk cells and allowing the body to age at a healthy rate. Some medical conditions may be helped with vitamin C supplementation. The vitamin C treatment most strongly supported by clinical research is that of scurvy, according to MedlinePlus.com. Scurvy is technically a dietary vitamin C deficiency, and is characterized by fatigue, gum disease and poor-healing wounds. Other diseases that may be relieved in part by vitamin C supplementation, according to the University of Maryland Medical Center, include heart disease, hypertension and the common cold.